Sree Padmanbhadasa Sree Chithira Thirunal Balarama Varma, GCSI, GCIE (November 7, 1912-July 20, 1991), popularly known as Sree Chithira Thirunal, was the last ruling Maharaja of the Princely State of Travancore, in southern India till 1949 and later the Titular Maharajah of Travancore till 1991. 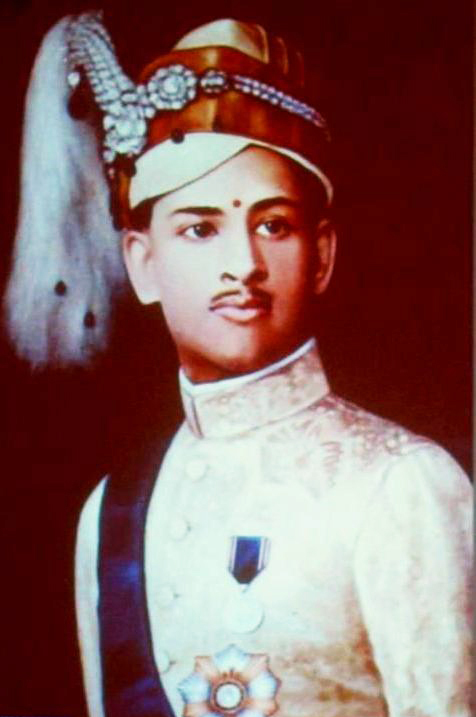 Sree Chithira Thirunal was the eldest son of Junior Maharani of Travancore, H.H. Sree Padmanabhasevini Vanchipala Dyumani Rajarajeshwari Maharani Moolam Thirunal Sethu Parvathi Bayi, and Sri Pooram Nal Ravi Varma Koyi Thampuran of the Royal House of Kilimanoor. He was privately educated, and became the Maharajah of Travancore, at the age of 12, upon the death of his maternal great uncle, the then Maharajah of Travancore Sree Moolam Thirunal, on August 7, 1924. He reigned under the regency of his maternal aunt, Sethu Lakshmi Bayi (1924-1931), until he came of age and was invested with full ruling powers on November 6, 1931. The period of Sree Chithira Thirunal's reign witnessed many-sided progress. He enacted the now famous Temple Entry Proclamation in 1936, established the University of Travancore (now the University of Kerala) in 1937. The Women Studies Journal Samyukta reports that, 40% of the Travancore's revenue was set apart for education, during the reign of Sree Chithira Thirunal. Thiruvananthapuram International Airport, Travancore Public Transport Department renamed Kerala State Road Transport Corporation, Pallivasal Hydro-electric Project, Fertilisers and Chemicals Travancore(FACT) etc. were established by him. Historians like A. Sreedhara Menon credit him for the industrialization of Travancore as well. According to researchers, the Punnapra - Vayalar incident in 1946 which led to the death of hundreds of Communist Party workers, the declaration of an independent Travancore in 1947, and allowing too much power to his Prime Minister, Sir C. P. Ramaswamy Iyer, would represent the negative aspects of Sree Chithira Thirunal's reign. Upon India's independence from the British on August 15, 1947, Sree Chithira Thirunal initially chose to keep his domain an independent country. As this was unacceptable to the Govt. Of India, several rounds of negotiations were held between the Maharaja and the Indian representatives. Finally an agreement was reached in 1949 and Sree Chithira Thirunal agreed to merge Travancore officially as a part of the Union of India. In 1949, Travancore was united with Cochin, and Sree Chithira Thirunal served as the first and only Rajpramukh (Governor equivalent) of the Travancore-Cochin Union from July 1, 1949 until October 31, 1956. On November 1, 1956, the state of Kerala was created by uniting the Malayalam-speaking areas of the Travancore-Cochin Union with Malabar, and Sree Chithira Thirunal's office of Rajpramukh came to an end. Sree Chithira Thirunal was an Hon. Major General with the British Indian Army and the Colonel-in-Chief and the Supreme Commander of the Travancore Military and of the Travancore-Cochin State Forces, for the period 1924-1956. He became an Hon. Colonel in the Indian Army since 1949, as the Travancore Military was integrated by him into the former, as the 9th (1st Travancore) and the 16th Battalion of the Madras Regiment(2nd Travancore). After the Constitutional Amendment of 1971, he was stripped of his political powers and emoluments from the privy purse by the Indira Gandhi government. At the age of 78, after suffering a stroke, he fell into a coma for nine days and died on July 20, 1991. Along with the Sree Chitra Thirunal Institute of Medical Sciences and Technology, many other charitable trusts were established using the funds, land and buildings provided by him. Sree Chithira Thirunal also sponsored the higher education of a young K. R. Narayanan who went on to become the 10th President of India.